KAHULUI — The Maui High School football program had a golden opportunity in front of it just nine months ago. A semifinal berth in the Division I state football tournament, just the third state appearance in school history, dissolved into a 26-7 loss in the mud and rain at Wong Stadium to eventual state champion Hilo. With no Oahu Interscholastic Association team in the bracket, Hilo went on to beat Damien for the Big Island’s first D-I state football crown, something the Maui Interscholastic League is still looking for. With a team in position to reach the state tournament in back-to-back seasons for the first time in school history, Kammerer is determined not to let the opportunity slip away again. The Sabers open MIL play Saturday night at King Kekaulike. “Sadly, we did play like rookies last year and it did come from our preparation, it came from how we acted on the trip,” Kammerer said. “So, that’s not the expectation or the norm this year. We’re expecting to be better student-athletes in the classroom, we’re expecting to be better members in the community. Kammerer, a former Kahuku standout player and assistant coach, has stepped in to the head job in Kahului while Rodney Figueroa has moved back to defensive coordinator to recover from an illness. Both men say Figueroa will return to the head-coaching position next season and they work closely to help one another. 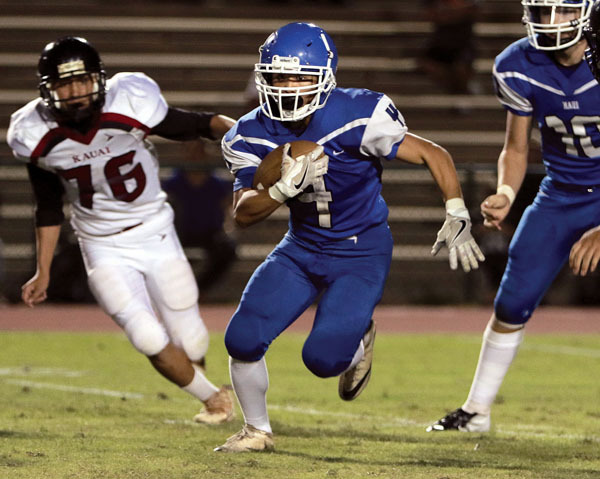 The Sabers unveiled a passing attack that accounted for 244 yards in a 31-14 loss to Kauai in their nonleague opener. 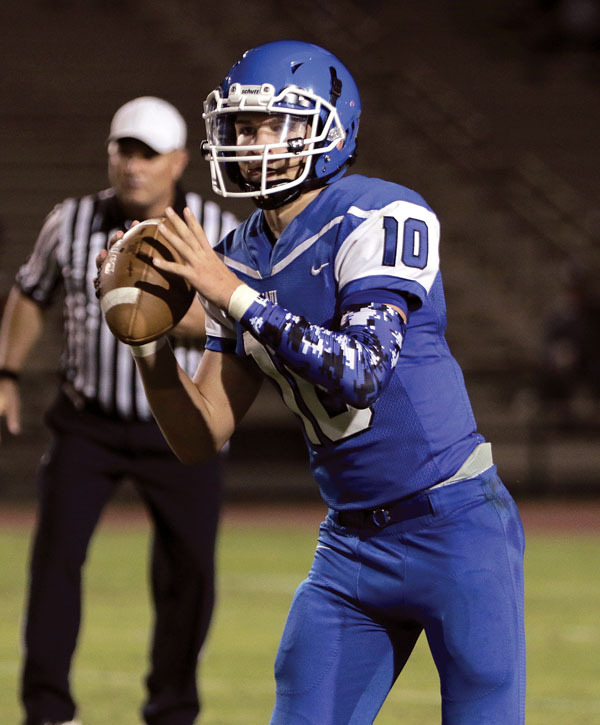 The Sabers averaged just 66.4 yards passing per game last season, but junior quarterback Brex Delray found five different receivers in the game. 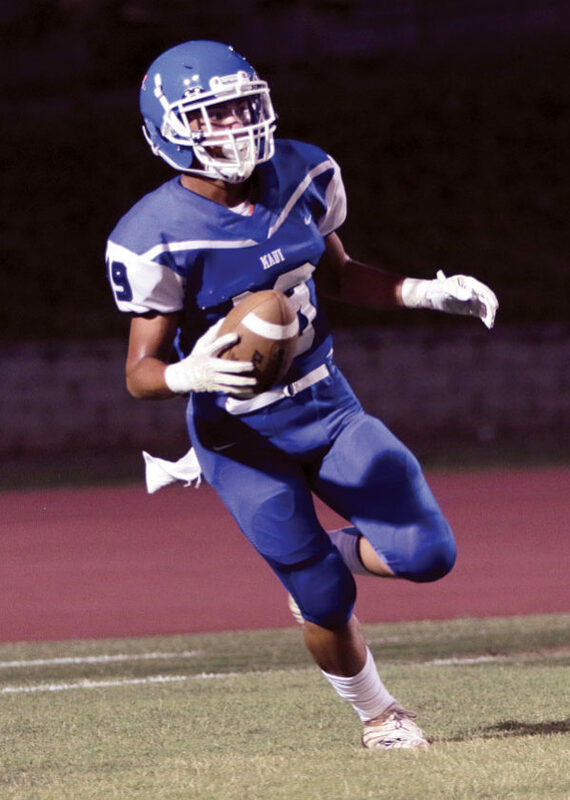 Trent Takara caught six passes for 136 yards, and Christian Lee and Mitchell Hirose each hauled in touchdown receptions. Junior running backs Naia Nakamoto and Solomone Tongi finished third and sixth, respectively, in MIL rushing last season, accounting for 1,140 of the 1,973 rushing yards the Sabers had in MIL play. With those two out for the Kauai game, Maui High managed just 4 net yards on the ground. Maui High averaged 313 yards per game last season on offense, while the defense was No. 1 in the MIL, surrendering just 237.1 yards per game. Reigning MIL Defensive Player of the Year Atu Falekaono, a 5-10, 245-pound senior linebacker, missed the Kauai game with shin splints. He expects to be ready for Saturday’s MIL opener. Practices have become a little more intense this season. “Practice-wise, we’ve been trying to increase tempo, increase repetitions,” Kammerer said. “Things haven’t been perfect, but knowing that it’s a long season, really the hustle, the attitude, the behavior — that’s what we’ve been trying to improve.